Less than one month until the NFL season begins. And if you’re a New England Patriots fan like me, you’re still on a high from the absolute best Super Bowl of all time. Super Bowl LI was something else. I mean, how unbelievably remarkable was that comeback? One minute the Patriots were behind 28-3 in the 3rd quarter and the next thing you know they’re on Duck Boats at their victory celebration as Super Bowl Champions! I’m still an emotional wreck just thinking about it. But luckily, a good emotional wreck. Making the impossible possible, it’s hard to not to forget about it, and six months later it’s hard not to want to let go of all the shock and happiness – even if we are on to a new season. In my head, this thought process went from shiny Super Bowl rings to crispy, delicious onion rings. All roads lead to food. Some of the best onion rings are found as part of a seafood platter at most clam shacks on Cape Cod. And I admit, the onion rings at Burger King and the tower of onion rings at Red Robin aren’t too shabby either. Yes, I just said that. But I give credit where credit is due – even when it involves a creepy looking king or hearing the restaurant staff sing a non-copyrighted version of “Happy Birthday” to every other table around you. As much as I wish I could be on the Cape every day for lunch, and not wanting to go to Burger King or Red Robin because I don’t want to give in to my guilty pleasures, I was trying to figure out how to cure my onion ring hankering. The pull was strong, my friends. So instead of waiting to go back to the Cape for some beachside onion rings, or paying a visit to Burger King or Red Robin, I was going to make my own onion rings. And in honor of Tom Brady, I was going to make them healthy. Maybe even healthy enough that if Tom Brady is reading this (Hi, Tom!) he’d actually make them and eat them. Or enjoy them on his cheat day. I knew right off the bat I didn’t want to fry the rings so oven baking was the route to go. Sometimes I think of oven baking as second best, but in this case it’s right on top over frying. 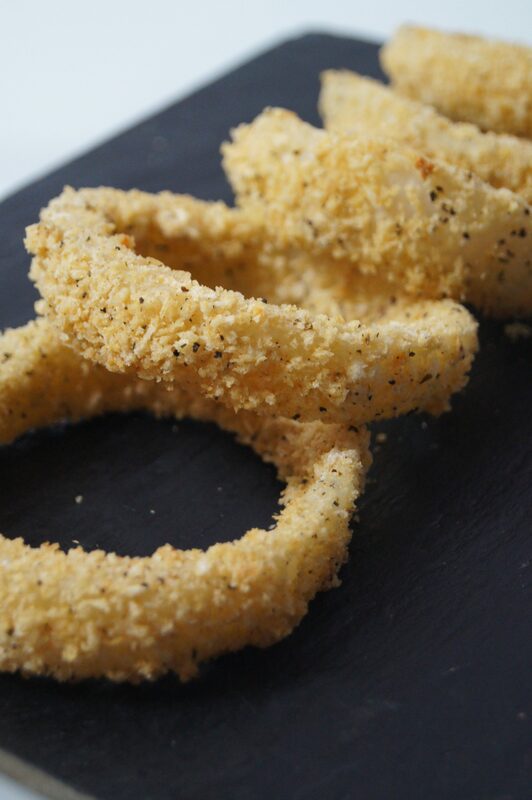 Baked at a high heat and using panko breadcrumbs (see below), the onion rings come out crispy as if they were fried. 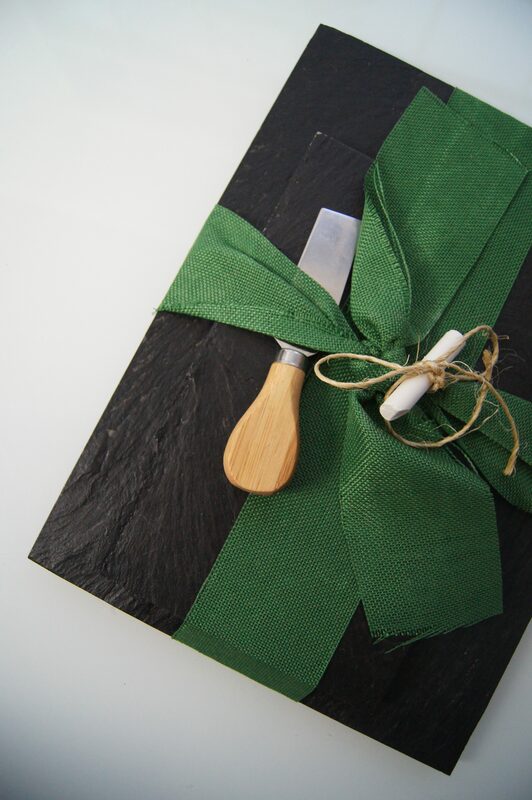 And you don’t have to deal with grease splattering on your face. Not a fun feeling. It’s always a plus when you can avoid some grease-splattered-induce swearing. I wanted to create something with a lot of flavor and a big ‘ol crunch. Instead of using regular bread crumbs, I decided to use Italian-style gluten-free panko bread crumbs. 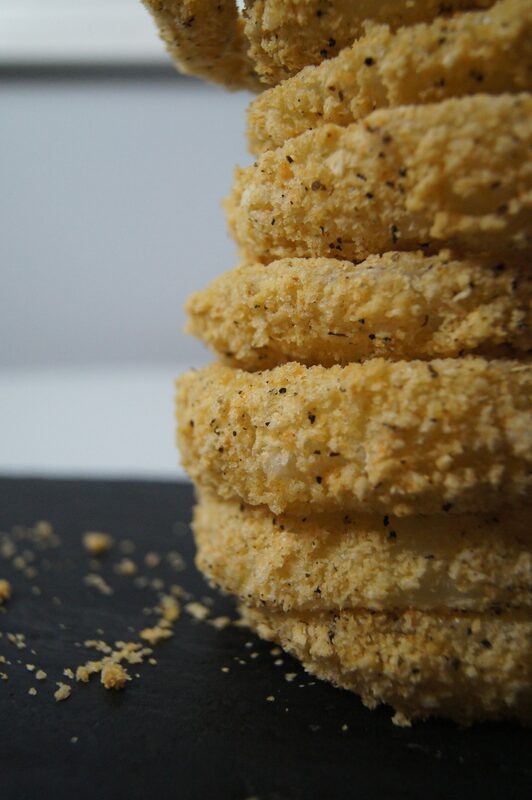 You can still use non-flavored gluten-full breadcrumbs and they will still be really yummy. And the crunch will still be there. 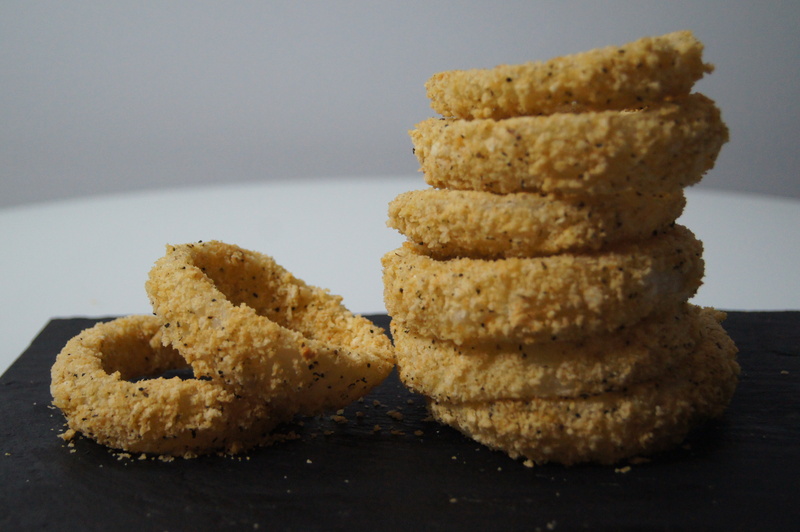 These onion rings were also really easy to make. In the same time as it would take to hop in the car and go to BK or Red Robin the onion rings are done. I like to dip these beauties in mayonnaise mixed with Sriracha. Blue cheese dressing or BBQ are good too. Oh, and there’s one of my all-time favorite dipping sauce: duck sauce. Tom Brady would probably frown upon my choices of dipping sauces. Look away, Tommy! 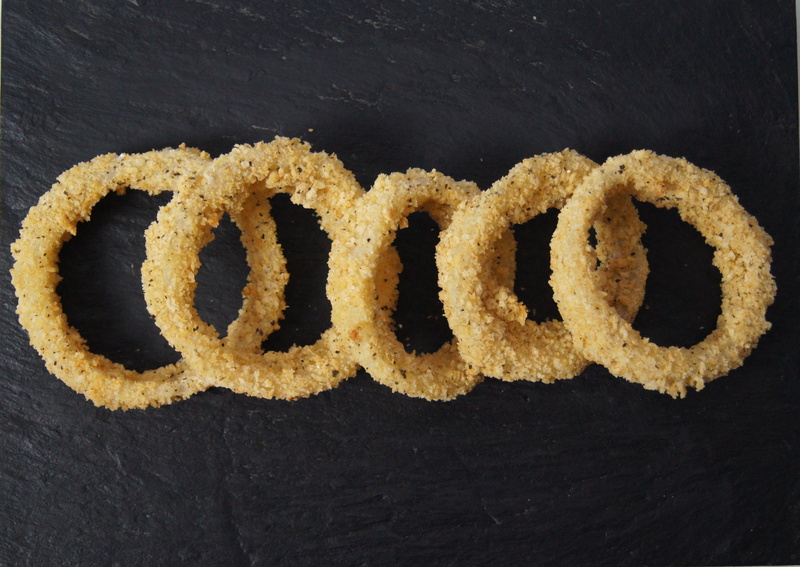 These onion rings are good on their own, dipped in deliciousness (hello, duck sauce! ), or served as the crown in a bacon cheeseburger. 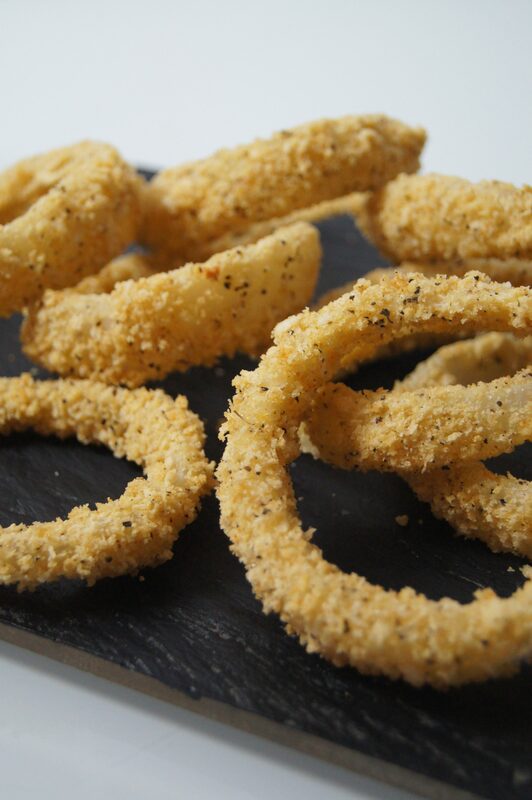 And these onion rings are great for game day. Especially when you’re cheering on your World Championship Team! And cheering how good-looking they are. Well, hello there, Brady and Edelman. p.s. 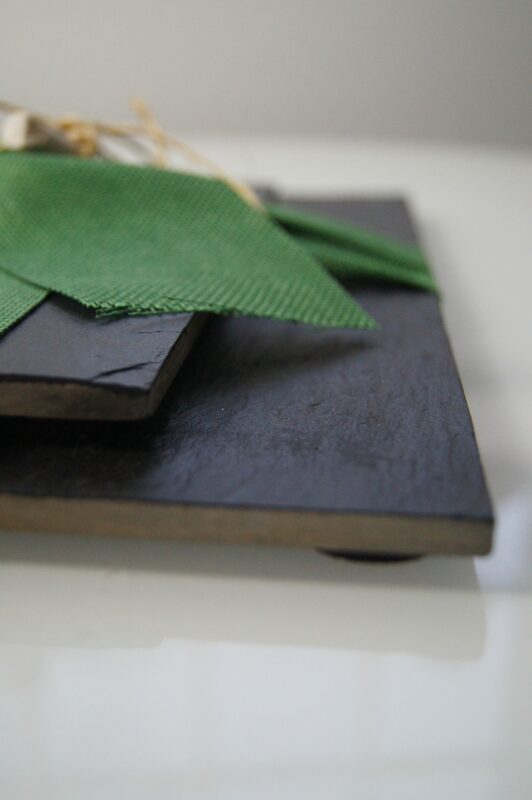 The slate boards in this post were handmade by my good friend, Kelley. Look at how beautiful they are! Prepare a large bowl of cold water. Slice onions into half-inch wide rings and place in cold water. Stir together tapioca starch (or cornstarch, if using), salt, and pepper in a medium sized bowl. In a separate medium sized bowl whisk egg whites. In a third medium sized bowl, add panko breadcrumbs. Take one onion ring from the water, letting the excess water drip. Place the onion ring into the tapioca starch, making sure to evenly coat the ring. Then place it in the egg whites until it is even coated. 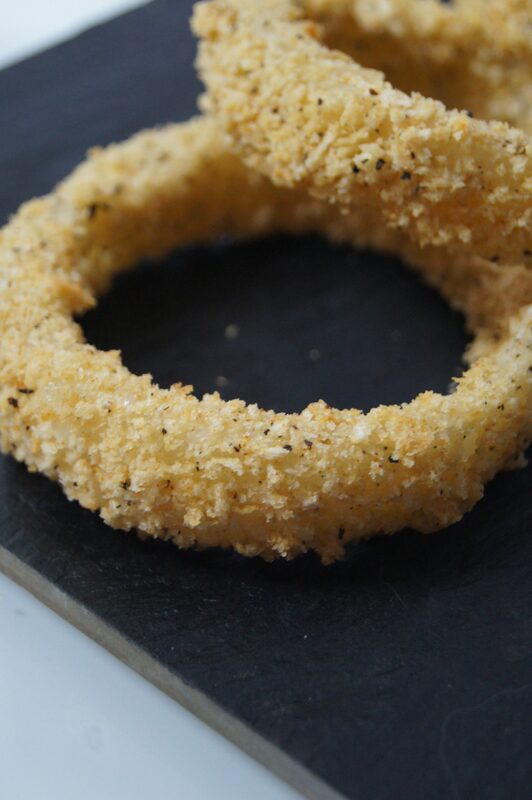 Lastly place the onion ring into the panko breadcrumbs, coating it evenly. 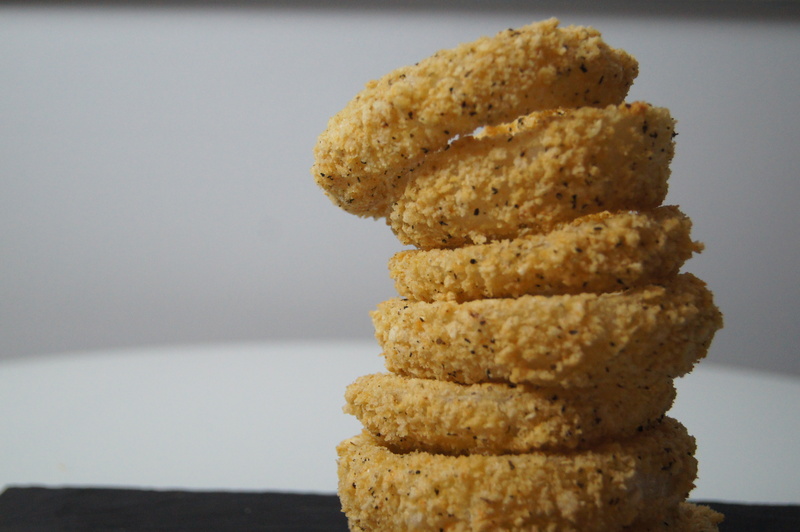 Place the onion ring on a baking sheet and repeat with remaining onion rings. 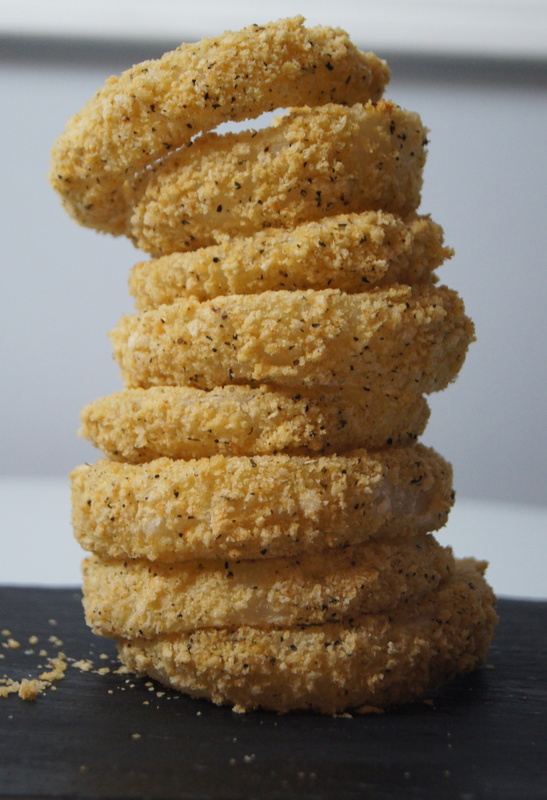 Spray the coated onion rings with cooking spray. Bake for 10 minutes. Flip each ring over and bake for another 5 minutes, until golden brown. Serve immediately with ketchup, Sriracha mayonnaise, duck sauce, or any your favorite dipping sauces.